Product categories of Rail Turnout, we are specialized manufacturers from China, Rail Turnout, Rail Train Track Turnout suppliers/factory, wholesale high-quality products of Re Rail Frog Turnout R & D and manufacturing, we have the perfect after-sales service and technical support. Look forward to your cooperation! There are many types rail turnout of equipment on the railway to ensure the safe rotation of locomotives and vehicles, and the number is too many to count.There are Single turnouts, symmetrical turnouts, three-way turnouts, crossovers, multiple turnouts. One of the most common and most numerous is a kind of single opening pass, which can make straight stock lanes and trains running on the crossroads transfer to each other, even if the train turns from the straight lane into the ramp, or from the ramp into the straight. In addition to the single-track turnout, there are two-way and three-way turnouts. The former connects straight roads with two symmetrical corridors, while the latter can go straight or branch to two different corridors. Two-way and three-way roads are more commonly used in the throat area of marshalling yards. Single-turn turnouts are classified by rail type, with 60, 50, 43 kg/m single-track rails. There are 6, 7, 9, 12, 18, 24, 30, 38 and so on. The 6 and 7 single-way gangs are only used for internal railways or humps in factories and mines. 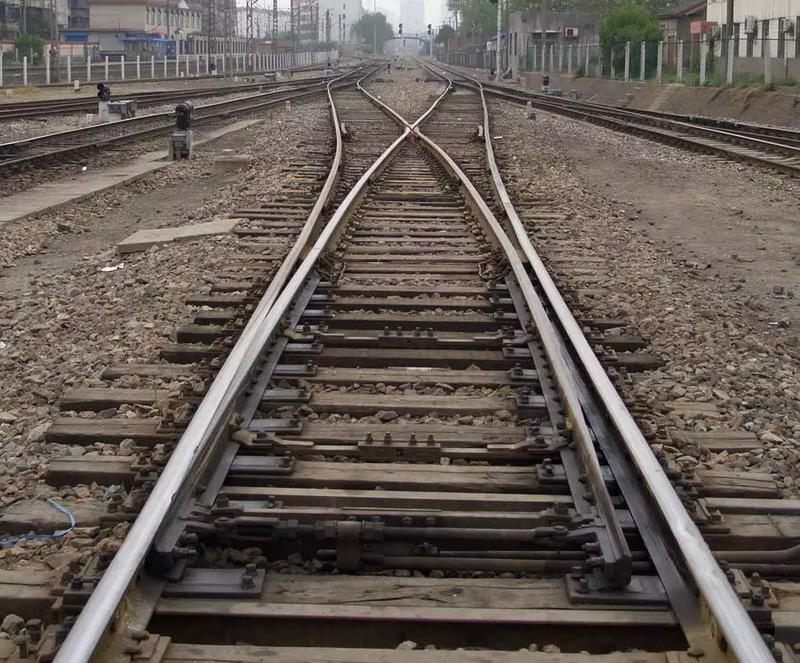 Others are Applicable to the railway main line and station line, and most commonly used on the 9th and the 12th, in the section where the side line passes the high-speed train, you need to lay large numbers such as No. 18 and No. 24. The turnout number N is based on the cotangent of the frog angle α used, ie cotα. 1. The types of railway switches:608, 612, 615, 715, 915, 618, 718, 918, 622, 722, 922, 624, 724, 924, 630, 730, 930, 938, 643 and other non-standard ones. 2. Railway guage:600mm,762mm,900mm,1435mm and other foreign ones. 3. Rail type:8KG / M,12KG / M,15KG / M,18KG / M,22KG / M,24KG / M,30KG / M,38KG / M,43KG / M,50KG / M,60KG / M.
5.curve radius: 4,6,9,12,15,20,25,30,40,50,70 and all other radiuses. 1900MM, 2200MM,2500MM and all other spacings.